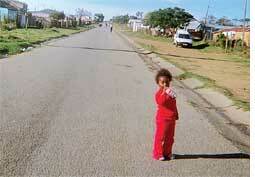 A little girl in bright red clothes stands by the side of the road. A family sits together in their lounge, posing for the camera. Images such as these form the bulk of the Defined by Four Letters exhibition at the National Arts Festival in Grahmstown South Africa. The exhibition was an expression of the lives and identities of hiv-infected people of Grahamstown. The photographs, together with drawings and personal testimonies, were the result of five months of art therapy classes held at the centre by student volunteer Karen Hye. "Every class had a theme," explains Hye. "I would ask women to draw a symbol of what they felt best represented who they were, or I would ask them to draw their family, or to think back to their fondest memories. These themes then provided guidelines for what the women would explore when we first gave out disposable cameras and encouraged them to capture aspects of their lives."